Princeton scientists have discovered a printed a functional 3 dimensional ear that can ‘hear’ radio frequencies which is a bit beyond the range of human capability. 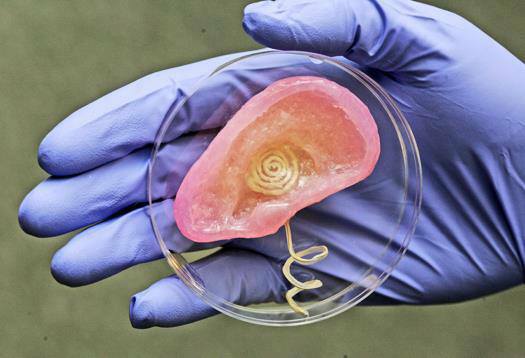 The amazing invention (3D-printed bionic) ear is made up of a metal part part ( coil ) which act as antenna and cartilage. It can detect ( hear ) radio frequencies which are far beyond the range of normal human capability. Ear reconstruction "it took much effort to reconstruct ear and it is the hard problems in the field of plastic and reconstructive surgery," they mentioned. To get rid of the problem, the team turned to an assembling way or method which is called 3-D printing. The scientist passed bovine cells (mixed in a liquid) gel through the printer.which contain tiny particles of silver.the printer then convert this to ear ( bionic ear ) type shape and silver particles into coiled antenna.these antennas do their function i.e. They pick up radio signals that the ear will decode as sound. The 3d ear is yet not designed to replace real one for humans but for research base.this is the amazing combination of electronics with biological material. It is very soft and translucent. it is bred for ten weeks. By letting the cell spread (multiply). It creates the flesh color and form hardened tissues around the antenna. It works between two technologies a 2 dimensional sheet of electronics and a surface or layer of the tissue.